Why We Love Steel Frame Homes - And You Should, Too! Lightweight steel framing is a practical, code approved solution to few of the challenges that builders face today when using wood in framing homes. Although the idea of steel creates a picture of heavy material, the steel used in residential construction is quite the opposite. Lightweight steel is readily available in most major markets, and even if construction is to take place in rural or remote areas, transportation costs should not be a factor. There are a number of suppliers in major centres, which keep prices competitive. Steel is recyclable. Using old cars, appliances, bridges, steel cans, etc., produces about 500 million tons of steel per year. About three old cars produce enough steel to frame a basic 1500 square feet bungalow. Steel is dimensionally solid in any climate. Steel is manufactured straight and once the wall is properly constructed it won’t shrink, crack or warp resulting in fewer cracks and nail pops. This results in fewer callbacks. Steel is insect resistant, and steel will not rot. Steel wall sections of equal strength will be lighter than solid wood sections. This makes the assembled wall sections easier to handle. Design Flexibility – Any residential plan can be constructed using lightweight steel framing. Steel framing members can be manufactured to any particular length. Future alterations or renovations are straightforward and can be easily done. The floor and roof assemblies can be fabricated from steel, or they can be wood. If steel framing is used, wood sheathing is often combined with the structural steel members. The use of wood sheathing allows for the attachment of traditional materials, such as asphalt and wood shingles. Thermal expansion of steel studs is not an issue. As the studs are insulated on the exterior to reduce thermal bridging, and as the whole wall is made of similar materials, any movement should be uniform. The installation of wood finishing and materials into a steel frame can be accomplished by placing wood blocking around openings. This adds to the time and cost of installation. Jambs and windows are now often screwed into their openings while trim work can be stapled using a power nailer. The scheduling of trades remains the same as wood-frame construction. Additional preplanning is required if a design professional is involved. A lightweight steel house is constructed using the same steps as in wood framing. Subsequent trades follow once the structure is in place. The labour cost for the first steel house erected by a builder is usually considerably higher than for a wood-framed house. This reflects the learning that is required by the trades involved. Most builders find that succeeding houses see a considerable reduction in the labour component. In most cases, a framing crew erects the steel framed house. Their hammers are replaced with a screw gun. Other equipment needed includes aviation snips and a chop saw. Some builders use prefabricated steel-framed assemblies, which can reduce site framing time. Services include plumbing, heating and electrical. The requirements for the electrical may vary slightly from region to region, but readily available materials can be used. While the price of lumber has fluctuated considerably over the last few years, the price of lightweight steel has remained relatively constant. This makes a direct cost comparison between wood framing and steel construction difficult. It is generally accepted that the price of the two systems is quite comparable when all things including the cladding are considered. The cost of lightweight steel framing is influenced by the labour component, which will be quite high during the learning curve, for example, the first few houses. Comparing steel framing to wood framing will vary widely because of the fluctuating cost of wood and by the variable labour costs. There are several factors to consider when comparing costs, with some of the variables being entirely subjective. Most independent articles on comparing the cost of steel framing to wood framing have priced them similarly when all aspects are considered. Steel studs stand up well during on-site storage before installation. This wall system is quite durable and should be comparable to wood framing if properly constructed. Testing to date indicates that the metallic coating will offer long-term protection to the base steel in a properly designed and built wall assembly. As for most wall systems, sheathing materials, in particular, exterior rigid insulation, will need to be protected as they can sustain mechanical damage and can be affected by prolonged exposure to ultraviolet light. The fire resistance ratings for lightweight steel framed walls, with the same finishes, is comparable to wood-framed walls if a mineral fibre is processed from rock or slag. Fire resistance ratings are most applicable for party walls that are used in multi-family construction. There does not appear to be fire resistance testing of residential exterior wall systems.Sound ratings for steel-framed walls are considerably better than for wood-framed walls. One of the biggest disadvantages of steel is its term-conductivity. Steel is over 400 times more conductive of heat than wood. A steel framed wall will have an overall R-value of only 46-70% of a similarly wood-framed wall with the same amount of cavity insulation. Increasing insulation from 31⁄2″ to 51⁄2″ in steel framing does not proportionally increase the R-value. To increase R-value, it is more effective to go from 16″ o.c. to 24″ o.c. ; in other words, reduce the number of places available for thermal bridging. Thermal bridging occurs when steel spans from the outside to the inside of the building envelope. It can cause high heating and cooling bills; the need for larger HVAC equipment; and moisture condensation on the warm side of the wall that can lead to mold. A thermal break of insulating sheathing should be used when framing with steel. If the insulating sheathing is fastened directly to the studs with metal connectors, a thermal bridge will occur at the fasteners. Install plywood or OSB sheathing or wood strapping on the studs and fasten the insulation to the panels or strapping to prevent thermal bridging. Steel framing goes hand in hand with insulated concrete form construction, where there is no chance of thermal bridging. But that is a subject for another article. Great website, http://www.mocoframing.com/ and my parents are strongly considering building a house with light steel framing because of this weather that is constantly changing, I feel that we would have a better chance of survival when there are things like hurricanes or just any other natural disasters. That’s a good point about steel being recyclable. I bet the fact that home’s frame could be recouped for part of its cost as scrap metal is appealing to some buyers. Also, if you’re green conscious that could be valuable to you. 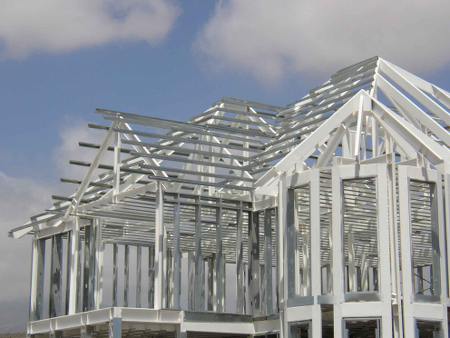 Steel framing has been around for years in Australia. A typical 2 to 3 bedroom home uses less than 4 tonnes of material, and in the kit-home industry, the house can be put together by a single person except for the licenced trades (electrical and plumbing / drainage). I built my own house this way. If one doesn’t want a concrete slab, there are steel sub-floor systems available. Fibre cement siding and internal sheeting and glass-wool insulation (made from recycled beer bottles) completes an essentially fire-proof construction. (Concrete slab is recommended for high fire-risk areas). Only one thing – if ever bringing in an outside trades person, you must warn them that the frame is steel, so that they screw rather than nail. However, I did my own joinery.